Cardiff Bus has launched its biggest service change in over ten years with a customer information day in the city centre. Representatives from the municipally owned operator were on hand to answer queries about the alterations, as well as to distribute new timetables and network maps at a special ‘info bus’ set up on Working Street. The changes follow an in depth review and are an effort to address changing travel patterns and customer feedback. Alterations are designed to ensure the company continues to provide an optimum service for its customers with the resources available, at a price its customers can afford. Cardiff Bus has also launched two new summer services. The new express X99 operates Monday to Saturday between Cardiff Central Bus Station and Barry Island, four times a day, until 30 August. Stopping at Leckwith Retail Park, Eastbrook, and Dinas Powys, the service leaves Cardiff Central Station daily at 10.05, 12.05, 14.05 and 16.05 with a schedule journey time of just over 30 minutes. The second new route is the number 91 between Cardiff and Penarth Pier, which operates every hour in the daytime on Sundays until 22 September. Buses will leave from the Cardiff Central Bus Station calling at Lloyd George Avenue, Mermaid Quay and Penarth Town Centre. 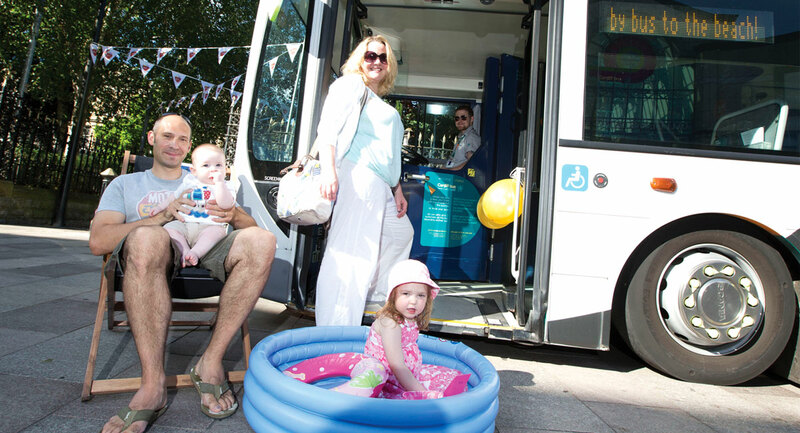 Pic: The Mortlock family catching one of Cardiff Bus’s new summer services.